Ah Lorna! We just love her pots. “My work is soda fired porcelain. 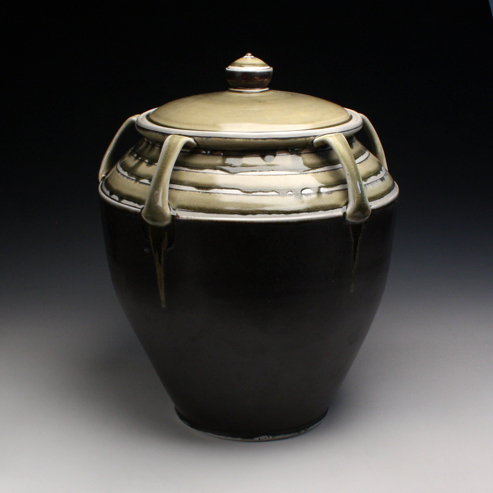 It begins with the consideration of function, and the goal is for the form and surface of the pots to be interdependent. Making the work starts with a three dimensional division of space, continues with drawing on the surface, and finishes with the addition of color. “New ideas are gradually incorporated into previous bodies of work through making. Source information for my pots can be motivated by something as simple as looking at the patterns in the stacked bricks of my kiln to something as complex as the forms in 18th century European manufactured silver. I experience the evolution of my work through creative repetition in the studio. “I am interested in having my work display both practical and extravagant attributes. I am drawn to work that is rich in ornamentation, with lavish use of materials- both scarce in a culture of mass production.